Great room and location. Super clean. Beautiful building with incredible artwork in the rooms and hallways! The decor and furnishings were a step up from your average hostel, even had reading lamps by each bed! It was pretty quiet when I was there, so it didn't really have much of a social vibe, but there was coffee/fruit/cereal available each morning. Plenty of stuff in walking distance during the daytime, but very little nighttime activity on the immediate block. Good wifi, showers could have been hotter. 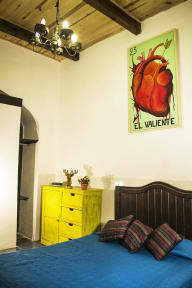 Amazing hostel right in the heart of the historical center. Big rooms with bathrooms and a private terrace. Basic breakfast. Nice room (5 girls) with private bathroom. Really good location and friendly staff. 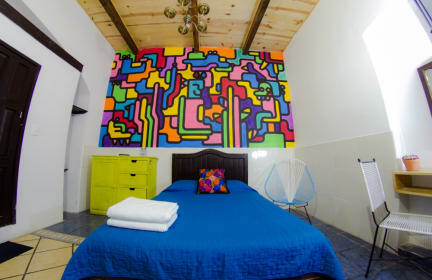 Great value and only a few blocks from the zócalo. Love the artwork in the place. Good hostel, very clean and the room are nice. Would recommend! We stayed in a double room with ensuite bathroom. There was no window in the room, so the it smelled like moisture and dust. There was a complete lack of air circulation in the room. The bathroom was ridiculously small and not so clean. It was impossible to take a shower without getting the whole bathroom floor wet. The hostel was pretty noisy at night with even staff members not respecting the 11PM rule for quiet time.